Students meet on Sunday mornings at 9:00 AM for a meaningful time of connection through God’s word. Our teachers prepare a challenging and creative study to apply Scripture to the everyday life. An evening packed with games, food, worship, teaching, and connection! We have a new study focus every month. Our goal is to experience connection with other believers and to facilitate a place where students feel like they belong. We start at 6:00 PM on Wednesday nights. A deeper bible study is sandwiched between hanging out and getting some food together. Show up at 6:00 PM but the study will start about 6:30. By about 6:45 we are on our way to our favorite food stop. We are always open to a last minute change of plans! Falls Creek is a summer camp for students finishing the 6th through 12th grades. This camp is the largest Christian camp in the world. It is owned and operated by Oklahoma Baptists, has a 100 year history and is extremely well done. It is an amazing opportunity for students to develop a great connection with each other and with God. 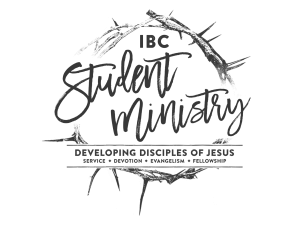 IBC believes in missions and our Student Ministry wants to give multiple opportunities for our students to catch that same vision. WC is a 1-2 week trip to any number of places in the US. Students get hands on experience with minor construction projects on homes of needy people and are encouraged to share about their faith in Jesus. Students learn to replace a window and share their faith in the same week.